On the sim of the Spencer Museum of Art of the University of Kansas stands a remarkable installation, a Petrovsky flux, created by Cutea Benelli and blotto Epsilon a number of years ago. 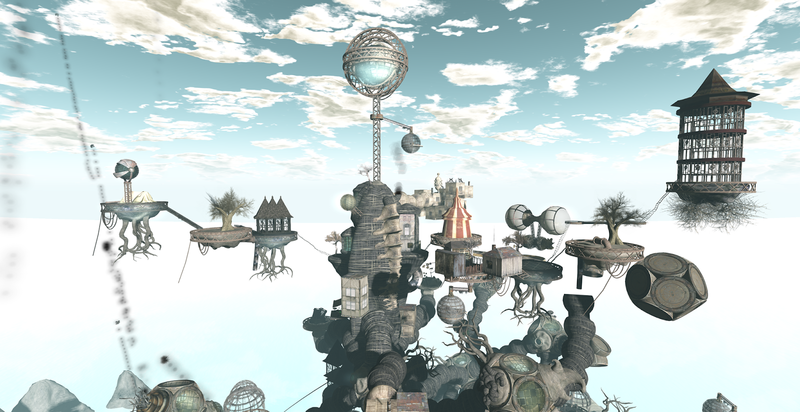 I would venture to say that it's the coolest place in Second Life. It's also probably about to disappear. It would be a shame if it did, and not only because the artwork itself is stunning: there's a public relations angle — although most universities pulled out of Second Life following the debacle of cancelled educational discounts (among other issues), the KU Spencer Museum quite proudly displays a Petrovsky flux on its home page, and a monitor in the gallery in real life allows patrons an opportunity to explore the installation. You'd think the Lab would be bending over backwards to work with model places like this as it tries to reinvigorate its relationship with higher education — not to mention how extraordinary a Petrovsky flux would look using the Oculus Rift. I spoke at length today with Stephen Goddard, associate director and senior curator at the Spencer and owner of the sim, and I'll just say that it sounded to me as though the Lab would be well served to improve its communications and outreach. Why the strikethrough? I'll create a new post. But I digress, sort of. Let's talk about the art. 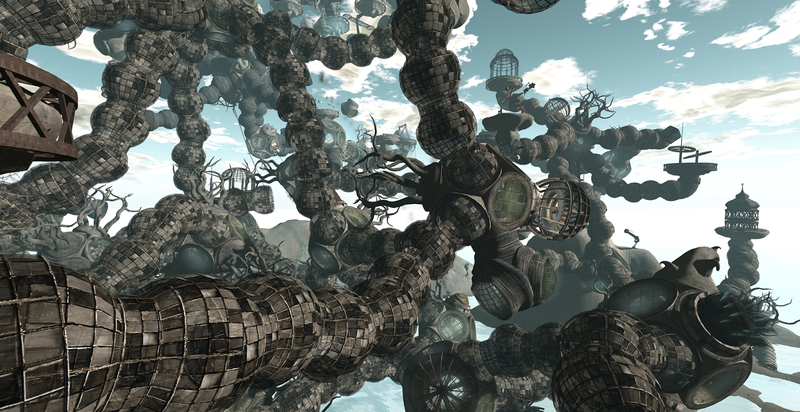 The flux (about which I wrote in 2010 here) is an extraordinary work, and aside from Bogon flux (another creation by Cutea and blotto, recently rezzed on LEA20 courtesy of Eupalinos Ugajin — read here) it's the only artwork I've seen in Second Life that seems to be alive. And there is something about it that looks somewhat organic, with gnarled branches and strange grasses growing out of shapes at odd angles. 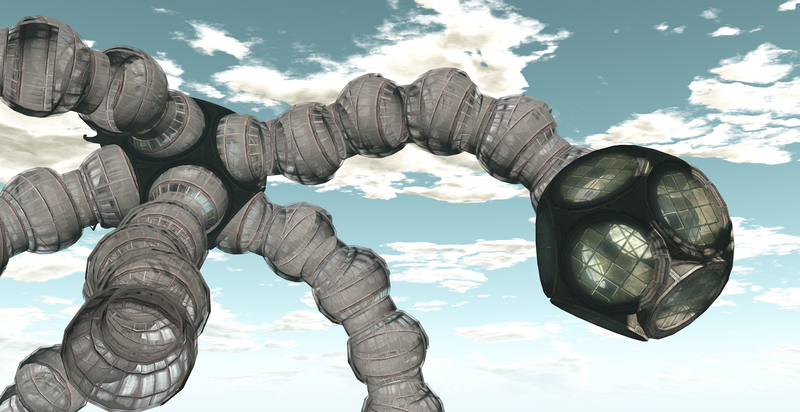 Beginning with a small base, the flux builds itself, adding one object after another, its limbs extending upwards far into the sky in twisted knots, until the entire thing suddenly and without warning begins to crash down to the ground (some pieces rolling into the sea), and then rebuilds again, resuming its work in an endless cycle of creation and destruction (although never the same way twice, as far as I can tell). At the landing point, click on a sign to get a noggin protector — it's a handy safeguard from falling debris. There are a few elements — some odd little platforms — that don't crash to the ground, and over time you'll learn which they are — there are even a couple little cafés where you can park yourself (my favorite at 53,210,36). And you can venture into the tunnels that the flux creates as it builds. The artwork is constantly in motion, with objects being added, objects rotating, objects falling and a few objects shooting upwards. Down on the ground, different elements emerge — in particular flying sheep (on which you can catch a ride if you click quickly enough) and bouncing chairs that present quite a visual show in mouselook. The standpipes are often teleport links, so try using them to explore, and don't miss out on the many interactive items throughout the build. One can easily spend hours here and not feel as if they've seen everything. Look carefully enough and you may even spot a flower or two. You are absolutely right, Ziki. 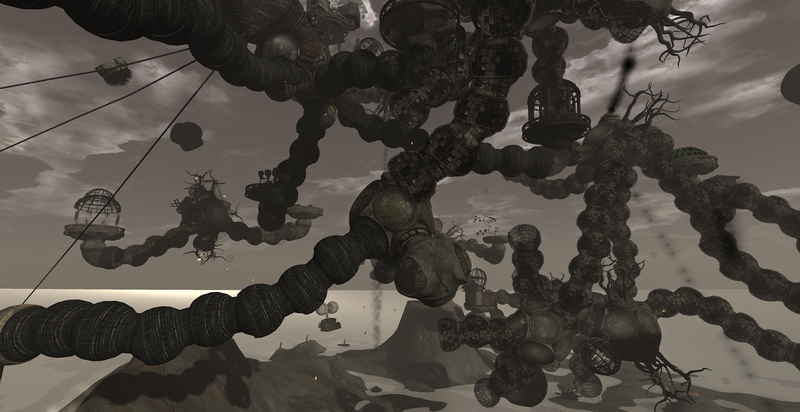 A Petrovsky Flux is one of the most beautiful installation in Second Life, It's a masterpiece. It would be a shame if it had to disappear. 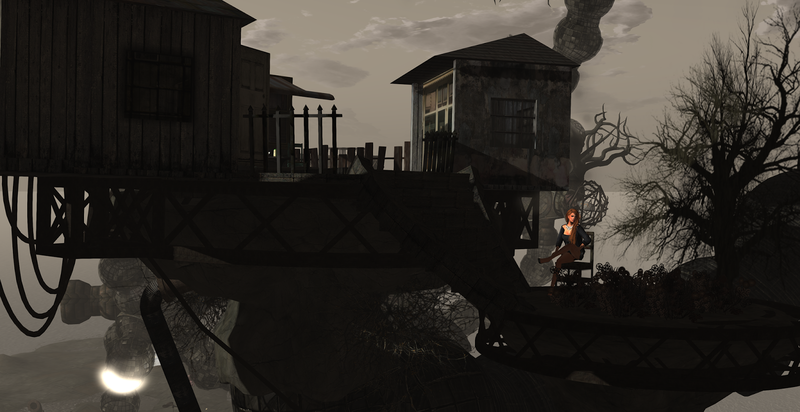 I hope Linden Lab does something about it. I haven't been there in a while, but it's an amazing place to photograph. I'll have to try and pop by ASAP. Thanks Ziki! Beautiful sim! And beautiful post too! Thanks, Indigo, Skye and Vanessa. Hopefully we'll be able to enjoy for a while to come — and I just posted an additional update in another post.